How to Easily Break Your Password-protected Office Documents? Microsoft Office has a featured function named encryption to lock and protect your data (such as Word documents, Excel spreadsheets, Microsoft Access databases) from unauthorized access. If you accidently forgot or lost your presentation files, Excel tables or other important files, you may be at a loss to retrieve it. On Microsoft website, Microsoft declares that you can't break Office password with built-in functions. In fact, there are still several methods for you to break Office password by using some special techniques. OK, let us to explore how to achieve it. Step 1: Open a blank document in Microsoft Word. Step 2: (In Office 2007 or later) Go to "Inset" tab, and choose "Object". And select "Text from File". (In Office 2003 or earlier versions of Microsoft Office)Click "Insert" and select "File" option from the drop-down menu. Step 3: Insert password-protected Office file to this blank Word document and the content of this file will be displayed. The method 1 is free and somehow effective, but some data may be lost in the transfer process. The most useful way is to obtain an Office password Breaker (Office Password Recovery) to retrieve your lost MS documents. Office Password Breaker is by far the most easy-to-deal and powerful program I have tested. It can quickly remove your forgotten password from the document without any data loss. Well, I would like to share my experience on how to reset Office document in detail. Hope it can help you. Step 1: Go to download Office Password Breaker, install and launch it. Step 2: Simply import locked Office file into this software by clicking "Open" and choose it on your computer. It supports any office programs and any versions for each. Step 3: Choose the proper recovery mode according to your practical conditions. Here we recommend "100% instant document decryption". And then click "Next". 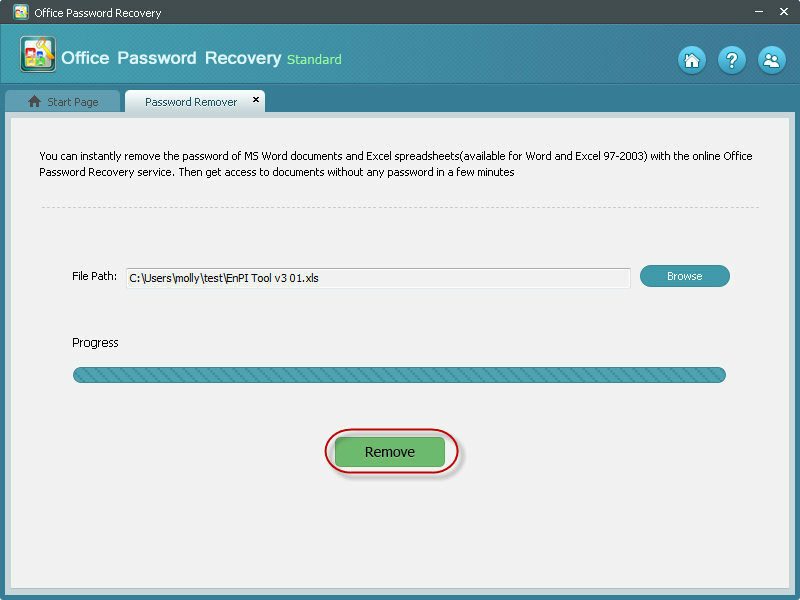 Step 4: Click "Decrypt Document" to start the recovery. Step 5: When it finished, you will get a newly generated unlocked Excel file which is stored in the same folder as you source file is.